Signing wonderkids in Football Manager is one of the best parts of the whole game. You simply can’t beat the feeling scouring the world for a talented youngster, dropping them into your first team and watching them turn into a superstar before your eyes. However, it can be tough finding the gems who will take your team to the next level. 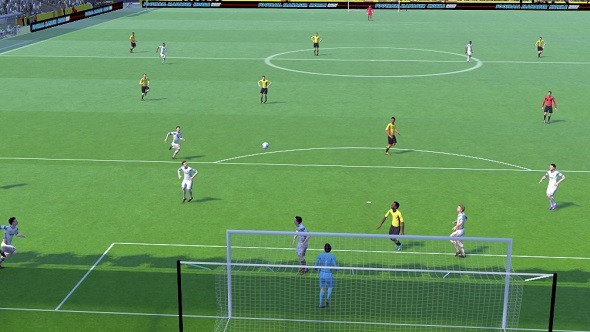 As time inconveniently ages our favourite youngsters and the top clubs have a habit of grabbing the best youngsters during the season, (cough, Gabriel Barbosa), most players have to start their search from scratch every time a new FM drops on Steam. 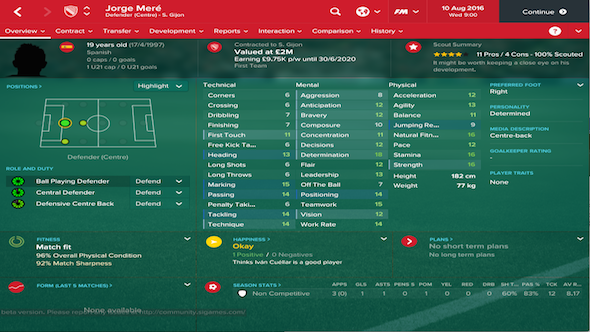 So to help you get back up to speed, we’ve compiled a starting eleven of FM17 wonderkids for your perusal. 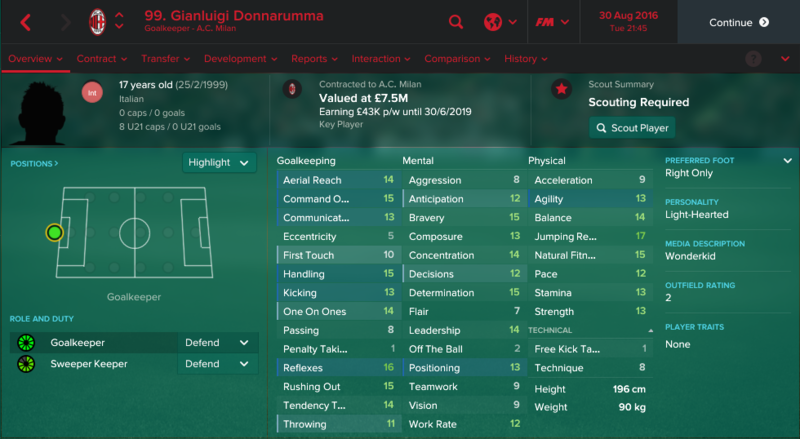 Giving you the lowdown on a top youth prospect in each position, an estimate on how much we reckon they’ll cost, and advice on the best way to use them, we think that signing any of these youngsters could help propel your team to the top of the table. 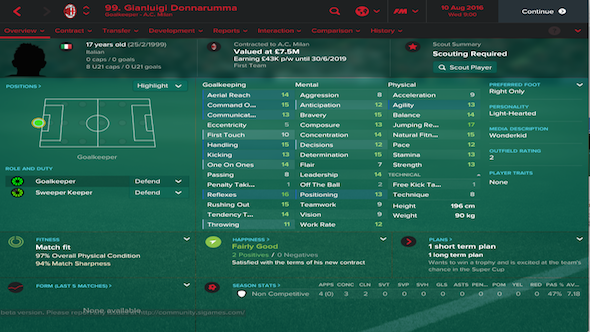 Gianluigi Donnarumma is the perfect signing for a high-flying team seeking long term solidity. The 17 year old keeper has already managed to get a season of Serie A football under his belt, so his FM17 stats reflect the fact that he’s a great bet between the sticks. The only sticking point with the young Italian is the price. Valued at £7.5m at the start of the game, it’s unlikely that AC Milan will part with the youngster for anything less than two or three times that figure. But when you consider that he has as many as 20 seasons worth of first team football in him, that initial outlay could prove a bargain in the long-term. 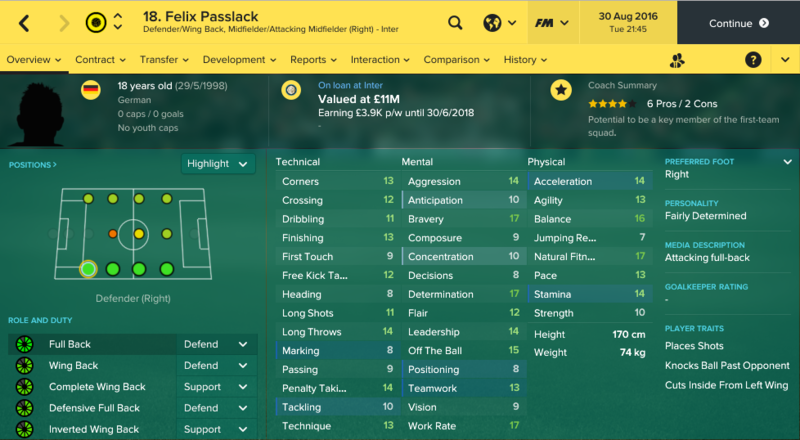 Felix Passlack is a versatile attacking full back. Hard working, determined and naturally fit, the 18 year old is an excellent option for anyone seeking an aggressive player capable of doing a job for the rest of his team mates. As with Donnarumma, Passlack is pricey with a value of £11m when you first boot up a save. But with Dortmund making him available on loan at the start of the game, he’s a solid temporary acquisition for any top-flight team seeking a right back who won’t stop running, or cover on the right wing. Need a centre back who is capable of bringing the ball out with his feet? Then Jorge Mere may well be your man. Boasting passing and technique stats of 14, the 19-year-old is excellent in possession. But he also boasts the strength to go toe-to-toe with powerful strikers, meaning that he won’t be bullied off the ball. That makes him a useful acquisition for most top sides across the continent. But as his composure and concentration stats aren’t brilliant at the start of the game, it’s important to provide cover for Mere when he steps out of defence. Avoid this problem by partnering him with a wiser head or playing him as the right-sided centre back in a three to make sure there is someone to sweep up behind him. 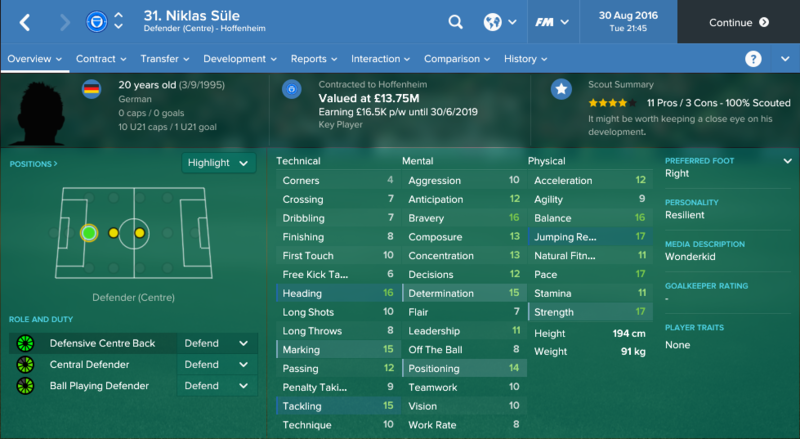 Niklas Sule is a properly old school centre back. Exceptionally strong, good in the air and remarkably quick once he gets going, the 20 year old German is the kind of player who you can easily build an entire defence around. He’s also easy to unsettle. Hoffenheim’s recent poor form means that Sule will actively look for a move early in the game, so declare your interest in the centre back as soon as possible. If you do that, you’re likely to get him for a little over his market value: an excellent amount of money for a player as good as he is. Kieran Tierney is a rubbish defender. His tackling and marking stats would barely be good enough for a League One left back, and they make a mockery of the fact that his favoured role is supposedly full back with a defence duty. 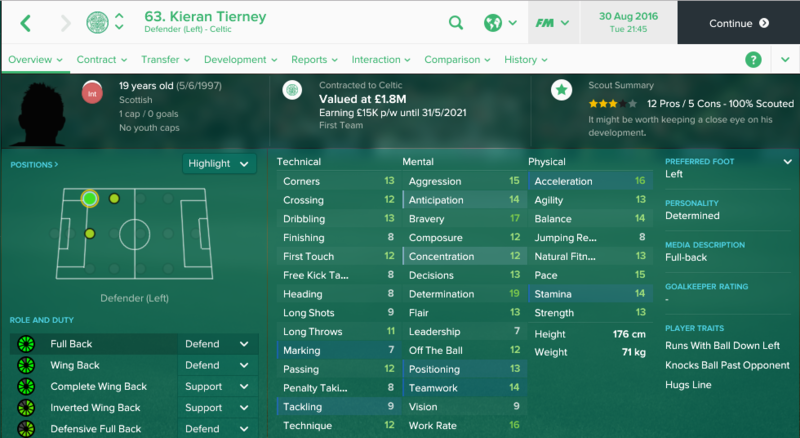 But if you ignore that, and look at his all round ability, Tierney has the makings of an exceptional attacking left back. He’s fast, hard working, can play a pass, is a reasonable crosser of the ball and has decent set piece delivery. So it makes sense to sign him and then train him up as either an outright wing back or a complete wing back behind an inside forward. Signing Tierney might leave you a bit vulnerable at the back, but he’s a great signing for attacking managers looking to stretch the play higher up the pitch. 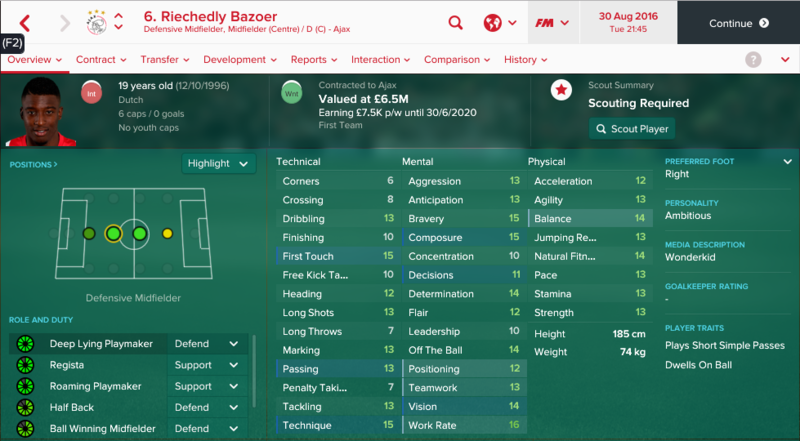 If you’re looking for a Sergio Busquets style pivot for your side, then Riechedly Bazoer certainly fits the bill. Though his passing stat of 13 could be better, his composure, tackling and work rate stats make him a good shout for the role of linking attack and defence. To get the most out of Bazoer, either play him alone as a deep lying playmaker in the defensive midfield slot or provide him with a partner and switch him to a support duty. By doing either of those things, you’ll ensure that he keeps playing short simple passes into the rest of the midfield: playing to his strengths and preventing him from attempting potentially wasteful longer passes. 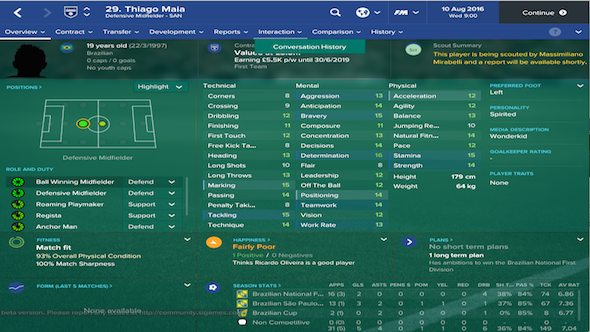 Thiago Maia is the cultured man’s midfield destroyer. Although he is good in the tackle, determined and capable of smartly positioning himself, he also happens to be a technically adept left footer who can happily balance most midfields. There are two main ways to take advantage of Maia’s skillset. If you want to field him as a ball winning midfielder in defensive midfield, play him with a partner to ensure he doesn’t leave your back four exposed when he goes hunting after the ball. Or, if you want him as a defensive midfielder, play the Brazilian by himself in between the central midfielders and the centre backs. By doing this, you can use Maia to both effectively screen against attacks and to feed the ball to aggressive midfield runners. 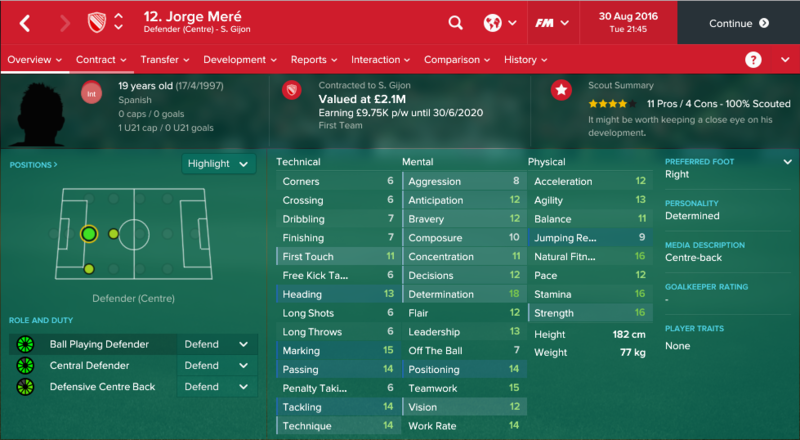 Here’s a lad you can easily become one of the best midfielders in the game by the age of 24, and whose start game price could probably be rustled up by you and a few friends, if it came to it. 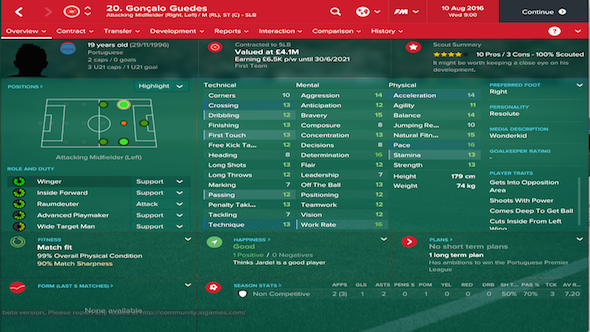 Technically gifted even at 16, Afonso Sousa only needs a couple of seasons worth of first team football to develop his mental and physical game and start finishing seasons at the 7.9x rating mark. 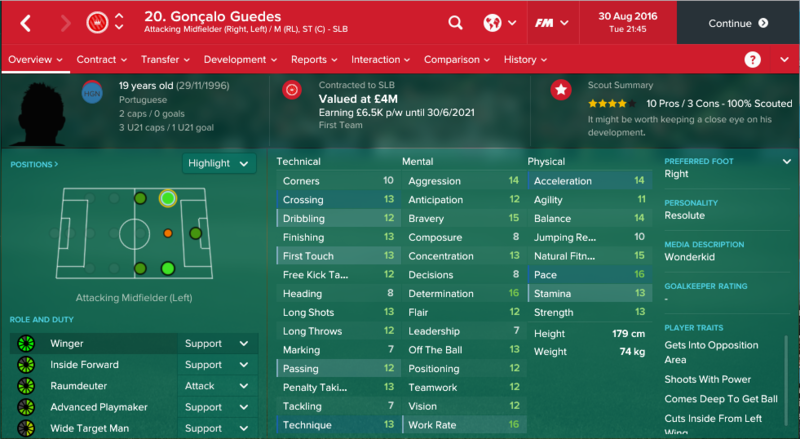 So many of FM 2017’s best young players occupy the AMC slot, so it’s handy to have a player like Afonso Sousa who can stand deeper too, passing and beating his man as the situation dictates. Ah, Goncalo Guedes. 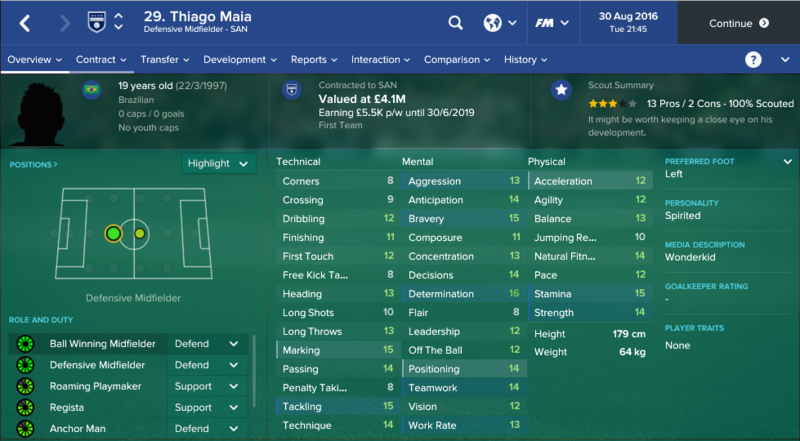 He’s been a favourite of the FM community for a couple of years now because he is one of the most complete wonderkids in the game. 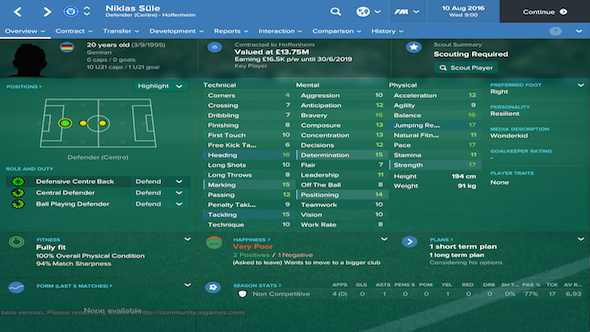 He’s fast, he’s hardworking and his personal traits make him a highly adaptable wide man. While it might take a big bid to convince Benfica to part with him, he’s worth breaking the bank for. Both well equipped to play as a right winger whipping in crosses or to retrained to play as a goal scoring inside forward on the left, Guedes has the potential to be your team’s Cristiano Ronaldo. Just make sure you sign him early before his cost spirals. As he’s initially valued at £4.1m, Benfica can’t do too much to resist a £20m bid for him. But if you leave him for a while, he will shoot up in value, forcing you to pay out even more for the talented youngster. Right, this is a weird one. Internationally renowned Spanish AMC Oliver is already an effective attacker at age 21. He’s a known quantity. And yet, on loan at a Porto side that almost never buy him, he’s quite often released by Atletico at the end of his contract just one season after the game begins. Oliver. Never mind, wait a year and swoop in – his wage demands are high, as they should be, but he’ll give you ten years of Champions League Football and that can’t be sniffed at. Where Oliver excels is in reading the game and technical skill, which is handy for an advanced playmaker. He’s not a natural goal machine, so you’ll want someone with dependable finishing ability playing in front of him (read on, gaffers) but the kid really is world class. 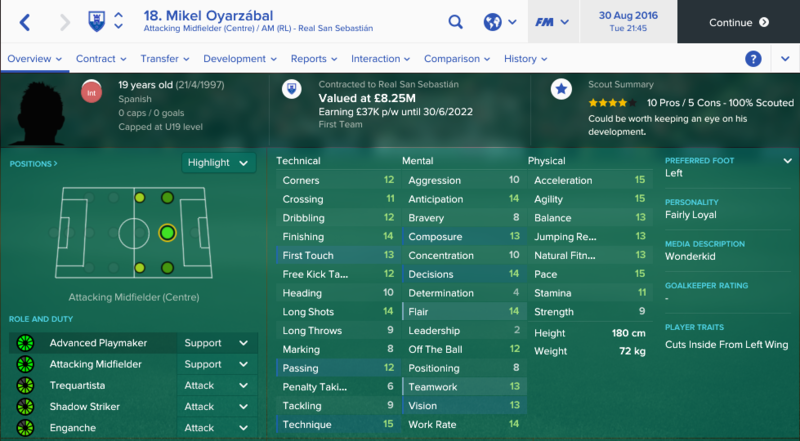 Oyarzabal is another one of those players where you need to read between the statistical lines to make the most of his skills. 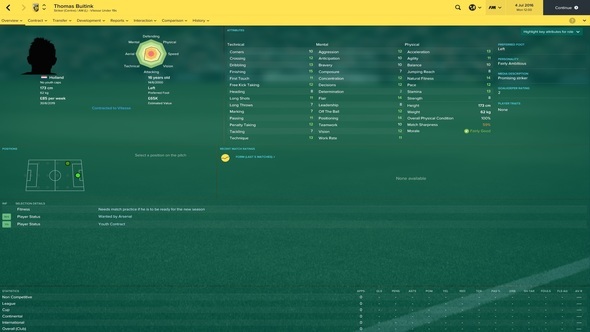 Although FM says he is best played as an advanced playmaker, he looks a little too average on the ball to become a world-class creator. 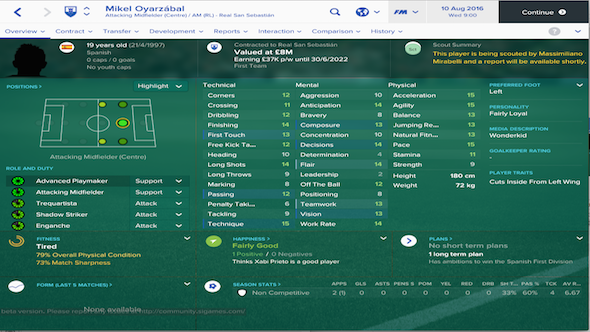 But if you look at his finishing and composure stats, Oyarzabal could become a dangerous force in front of goal. So if you’re looking for a goal scoring attacking midfielder to sit behind a striker, try retraining Oyarzabal to fill the role and get your coaching staff to teach him to arrive late in the box. It might turn him into a Lampard-esque goalscorer. Kean is the cheapest wonderkid on this list. But considering he’s already worth £170,000 at the tender age of 16, it’s certainly worth paying attention to him. 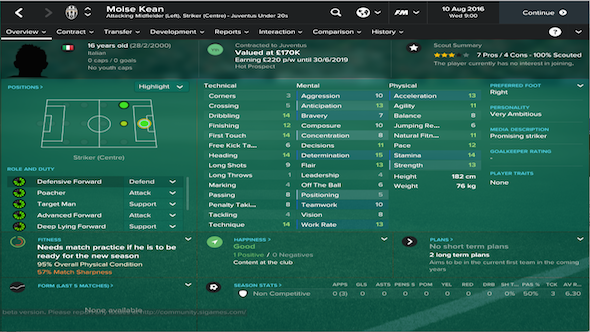 Described as the next Christian Vieri, Kean’s best position at the start of the game is as an inside forward in the AML slot. Technically adept, with strong technique flair and dribbling stats, he can pick his way through defences as he cuts inside onto his right foot. But at 182cm tall and unusually good in the air, there’s more to his game than simple wing play trickery. 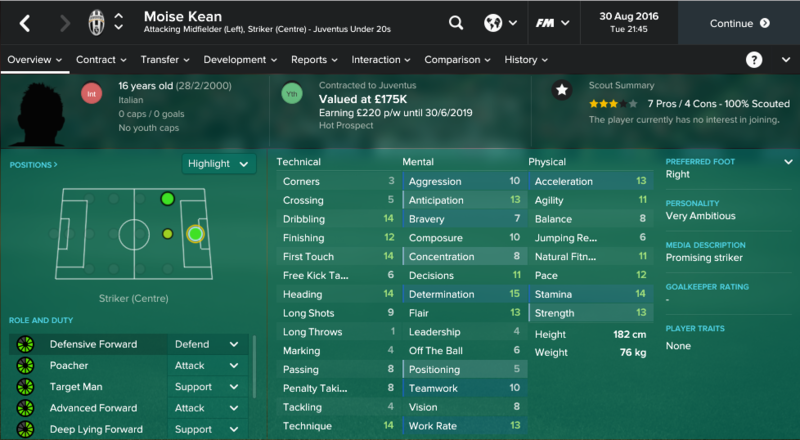 So it makes sense to sign Kean as a wide forward at the start of his career, before slowly shifting him into the central striking slot as his career progresses. That way he can use his combination of of strength and technical skill to hassle defences effectively as a lone striker. Finally, if you need a fox in the box then you’ll want to sign Maximilliano Romero. Although his work rate is a piddling 9, he also happens to be quick, intelligent off the ball and a good finisher. Add to that the fact that he’s only 17 and valued at £1.6m, Romero is an attractively priced striking option. But because he is a bit of a lazy bones, you’ll need to adapt your tactics accordingly. This means either playing him as a lone centre forward who finishes moves off or playing him with a striker partner who fashions chances. Sure, you might have to carry Romero a bit defensively to make the most of the youngster. But if you create enough opportunities for him, he’s likely to repay you with plenty of goals. Crikey, can Thomas Buitink score a goal. Promising at 16, he’s an absolute world-beater in his late twenties and always ends up at the big clubs with a 20 finishing stat and so many 16s and above that you start to wonder if someone hasn’t been naughty with the editor at some point. 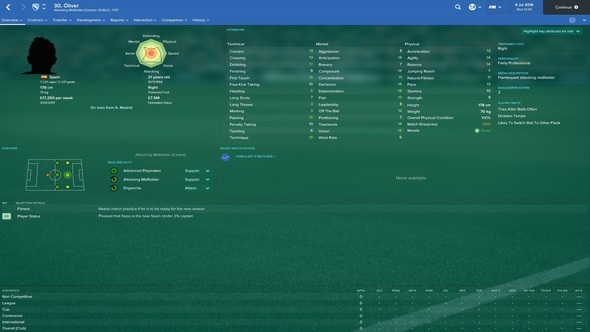 Buitink’s able to play as a complete forward, which gives you loads of tactical and formation options. He’ll never become a towering cross-finisher, but otherwise he has it all in his locker so for the £65k asking price and less than £200k you’ll need to secure him, he’s exceptionally good value for money.